It's time to celebrate the New Year and all you have to do is make an appearance at one of the biggest parties of the night to spin in plenty of major cash prizes! Click here to play! Baby New Year is an important guest at this party. You'll want to keep a close eye out for this little guy because he not only brings in major cash winnings if you can spin him across an active pay line, but he's also a wild symbol that will replace most others to help you create more wins. No party would be complete without a count down. This symbol is a jackpot and will bring in up to 500 coins if you spin five of them across a pay line. You'll want to mingle with the guests in order really get the party started. Spin three to five radiant red heads and you'll get up to 350 coins. Three to five blonde hunks will get you 300 coins. There are also taxis, wine glasses, beer, trumpets and food to aid in your celebration. You'll want to crack the bubbly at the stroke of 12, so be sure to collect three or more champagne bottles. These bonus symbols will trigger a bonus round that allows you to compete for even more cash prizes! So don your finest threads and get ready to party for a chance to win a whole lotta New Year's cash! Father Time acts as a scatter. Spin three, four or five of this iconic symbol and you'll bring in 10, 20 or 100 free spins respectively. Baby New Year acts as a wild. He will substitute for all other symbols, excluding scatters or bonuses, to help you bring in more wins. Spin two to five of him across a pay line and you'll get up to 5000 coins. If you spin three or more bottles of Champagne and you'll get to participate in a bonus feature. 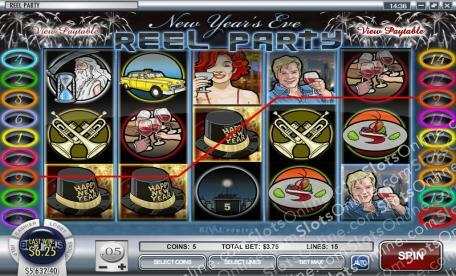 During this game, you'll choose from a selection of champagne bottles to open for the party. Each one will reveal a prize. All three will be added up to give you your bonus win.